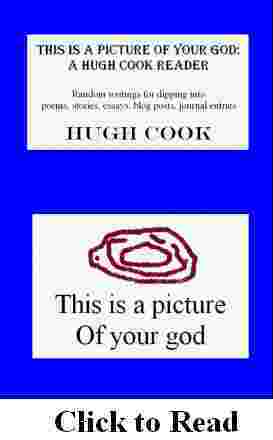 These death poems form part of the literary miscellany THIS IS A PICTURE OF YOUR GOD: A HUGH COOK READER. There are also two other death-related poems in the book, one a praise poem for Saddam Hussein and the other an informed consent procedure for death. 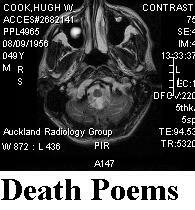 The other death poems are consolidated in a section entitled DEATH POEMS, which contains the items listed below. Page 353  Part Six  DEATH POEMS. 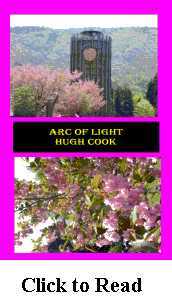 A selection of poems about death and dying, originally intended to be the core of a book of death poems, to be called THE DEATH OF BIRDS. Two additional poems were written for this series, item the poem, SADDAM IS GUILTY which is part of item thirteen, FLYING HIGH ON DRUGS, and item twenty-one, INFORMED CONSENT PROCEDURE FOR DEATH. A breakdown of the basic deal. Maybe you were misinformed. Never read their obituaries, but birds do die. This is a look at the process. A father betrays his daughter. He has his reasons, of course. Men always do. Naturally, there is another woman involved. A number of other women, in fact. As a deterrent, the death penalty fails. And what if the sentence is to be death, death guaranteed, no treatment on offer? I need a script for this, and, really, I need it now. So I can prepare for my death sentence. If that is what, in fact, is coming down the pipeline. Meantime, the world rolls on as usual, with the standard tragedies within it. Not if you are in the middle of a heart attack, obviously. Then your death becomes immediate. But one of the privileges of cancer is leisure. Time to sit around and drink red wine and eat chocolate. This, then, is a live life now poem, a seize the day poem. The familiar experienced as defamiliarization. A brain damage poem. If not death, then a siege, and ice cream city, quite possibly, no match at all for the besieging sun. The radiation has already made its impact. The enemy is already within the gate. Annihilation conceptualized: death as a big door. Visually impaired and, quite possibly, destined to go blind within the year. Blindness, if blindness, as a prelude to death. A product not, as far as I've noticed, to be found on the supermarket shelves. The self-obsession of a dying man: death conceived of as an act of selfishness. In the land of big broccoli, in New Zealand, far from the winter in Japan, there is, amongst other things, broccoli. Someone's daughter, not yet quite two years of age. Miss Energy Bundle, Miss Total Personality, death refuted by the instant. Accelerated aging, a problem which is not ours. But there is a problem, my love. The routine demands, and must be catered for. And all this other stuff, history, public events, the ongoing life of the world, given and to come, the future and the past  what exactly is that to me, right now? Before death, dissolution. Working with a partial brain.